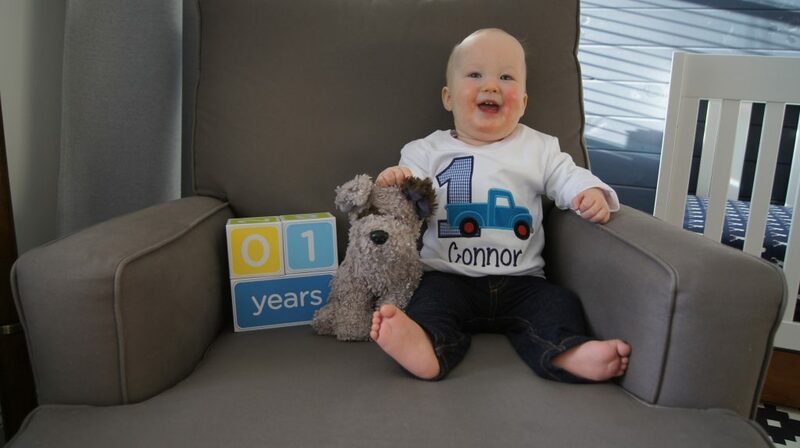 Connor is 1 year old today. I can’t believe it. I just can’t get over the fact that he didn’t exist before that, because it’s so hard to imagine life without him now. He has brought so much joy and a brand new meaning to our lives. It was a year of ups and downs and constant learning from triumphs and mistakes, but that’s parenthood, right? 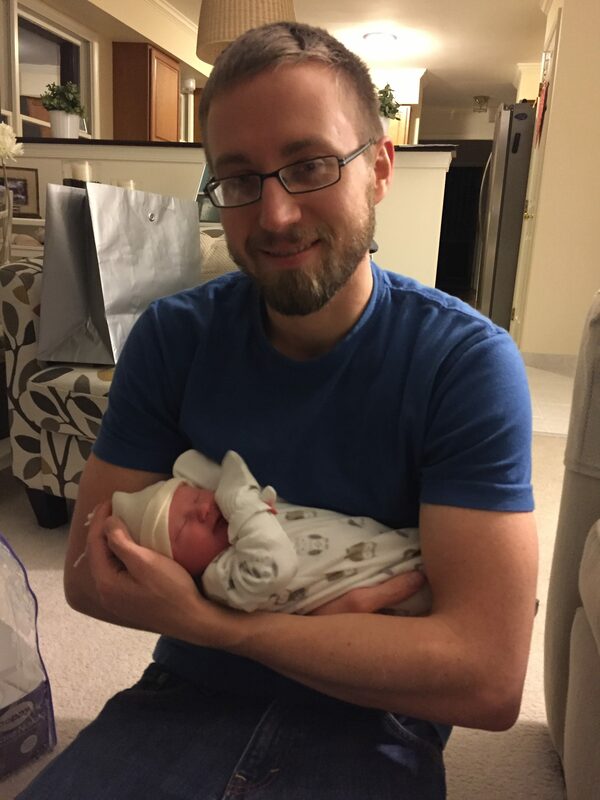 So, I figured today, on his birthday, I’d share his birth story. Partly because I’ve been wanting to write it for so long, and this has forced me to. But also, because I absolutely love hearing and reading other’s birth stories (what mom doesn’t??) I want to be able to remember all of the details about that amazing moment that he entered this world and became our amazingly handsome and precious son. I wanted to get David to participate in this too, so a la “The Magnolia Story” style (it’s a cute little book, I totally recommend), if you see anything written in italics, that’s David talking. I bought her that book as a Christmas stocking stuffer, so in a way this was my awesome idea. So if you’re not interested in a super personal story, I don’t advise you to read on. I wanted to share it because I think it could be enjoyable and educational for other mamas. 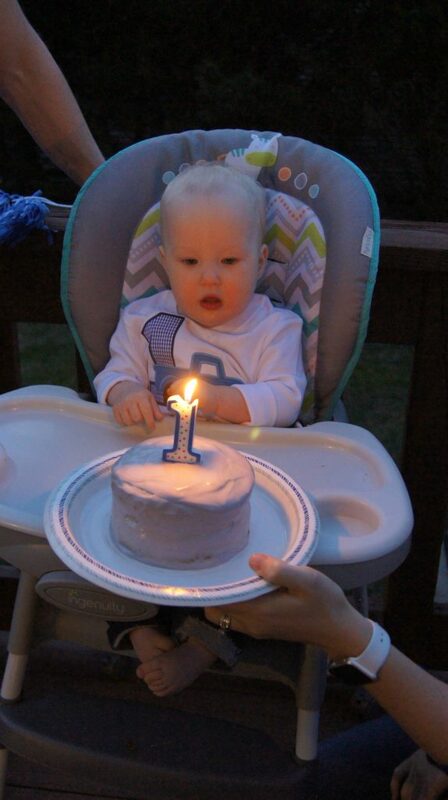 And because at Connor’s one year birthday, and the rest of my life, I can relive that experience through this story. I guess I’ll start back at the beginning. (Not at THAT beginning, geez.) 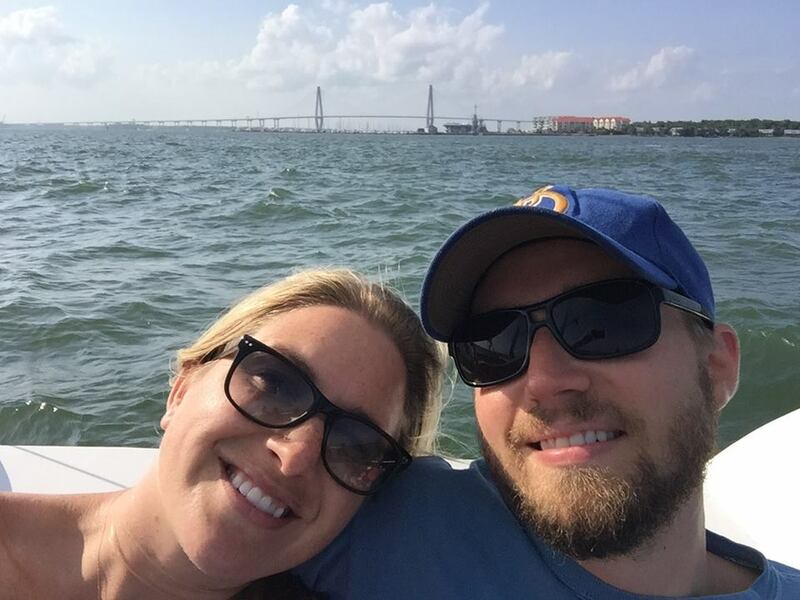 We were quickly putting the final touches on our South Carolina house, and had gotten back from our big bucket list vacation (2 weeks in an RV driving around New Zealand), where we knew that we were ready to be parents. We had felt like we accomplished a lot of great things: completed college, got good jobs, bought and renovated homes, traveled the world (maybe not all of it, but a good bit of it… we’ll save the rest for later in life)… we were ready for the next chapter in life. A co-worker that I used to carpool with said I was baby crazy. Apparently I talked about it a lot? Sorry Jake! 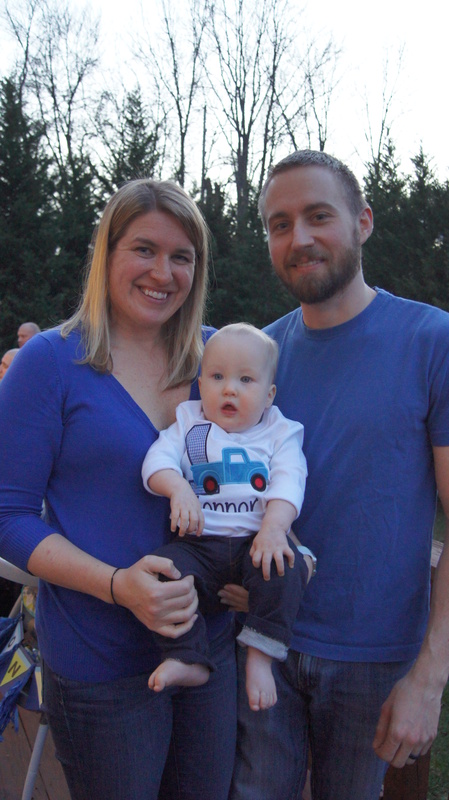 We were very fortunate to get pregnant quickly and have a very healthy and uneventful pregnancy. I am thankful everyday for that. My job rotation in SC was ending and we moved back to DE in September 2015. I started my new job and we moved in our new house. 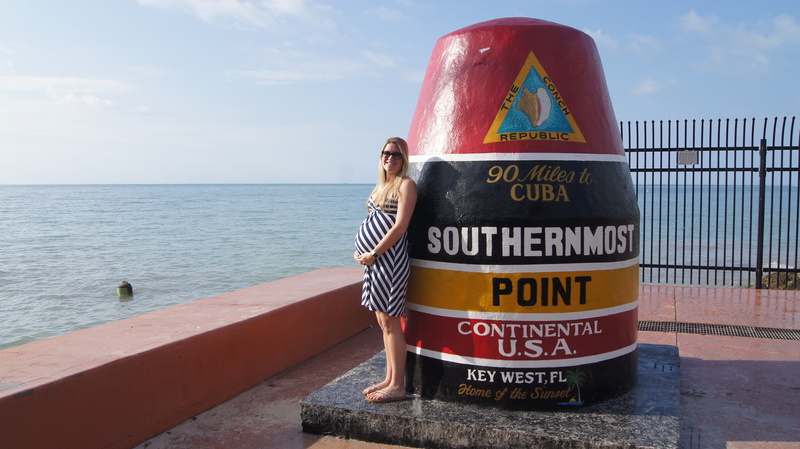 We got started on the nursery (see details here and here), took a fun little “babymoon” to Key West in January 2016, and we were all set with our birth plan. If you know David and I personally, we’re very much of the mindset of “Let food be thy medicine.” A close friend (hi Michelle!! Check out her awesome blog/business by the way!) was telling me about her pregnancy and birth experience at The Birth Center, and I was pretty much immediately sold. I consider myself pretty strong in the willfulness department, and even though I’ve probably never experienced any considerable pain before (I’ve never even broken a bone), I felt like I was made to give birth naturally, as millions of women had done before me. Plus, my amazing mom delivered me and my siblings all naturally! She’s a wonder woman. Michelle also recommended a great book, Ina May’s Guide to Childbirth, that helped confirm my decision to go forward with The Birth Center and use the wonderful midwives there. I was 34 weeks pregnant when I had my baby shower. I was 35 weeks pregnant when we finished the installing the flooring in the nursery. I was 36 weeks pregnant when we got our awesome bump (and later newborn) pictures done by Emily Troutman Photography. I had my 36 week appointment scheduled at the birth center at 36 weeks + 6 days because of mutual scheduling issues. At that appointment, you get checked for group B strep, and just make sure everything is progressing along nicely. I went to work that day afterwards and it was pretty uneventful. Until 3pm. I was wrapping up some things before I headed out for the weekend. I was sitting at my desk, and all the sudden I felt a gush. I mentally kind of broke down for a couple minutes, running back and forth to the bathroom and my office (luckily I’m the only woman in my building, so I didn’t have to worry about encountering anyone in there… perks of being a woman engineer, we’re not that common). I finally got myself together after a few minutes and gave David a call. He was at the local coffee shop working (he works remotely for his company from SC, if you weren’t aware), and I told him that I was pretty sure my water broke… he asked me if I was sure… I was like um, I think so? I’ve never had this happen before!? Well I also never got that phone call before. I wasn’t prepared to ask sensible questions. I also wondered about the test that morning and if it had somehow caused her water to break. I called my midwife and she told me to come in to confirm that my water broke. I left work… and on my way out decided I should probably tell someone that I was leaving. One of the chemists in my hallway was still around so I told him I thought my water broke and needed to leave. I think I surprised him. All he could manage was “Ok. Good luck?”. Men. I drove home and felt alright. David then drove us to the Birth Center which isn’t too far from our house. I had minor pains, but I was just more worried than anything. I couldn’t really be going into labor right?? I had so much I needed to finish up at work. We still had to put the crib together. 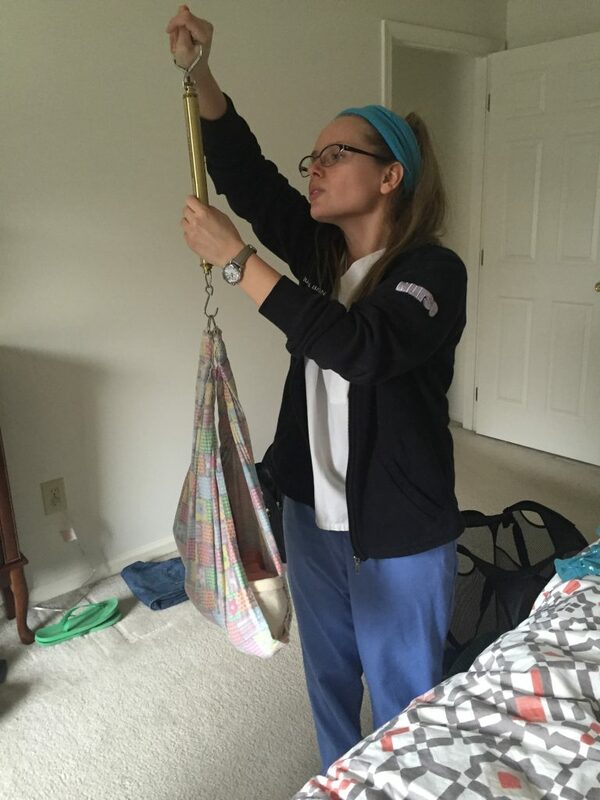 I still needed to pack my “hospital bag.” I wasn’t even 37 weeks yet! Of course none of those things mattered. Work would survive well enough without her. He wouldn’t be sleeping in his crib for weeks at least. We had written up a list of things to pack, so actually doing the packing was really simple. I called my mom to tell her that we were headed to The Birth Center to get checked out and see if my water actually did break. She wanted to rush right there, but I told her I’d call her back and let her know what the midwife said. 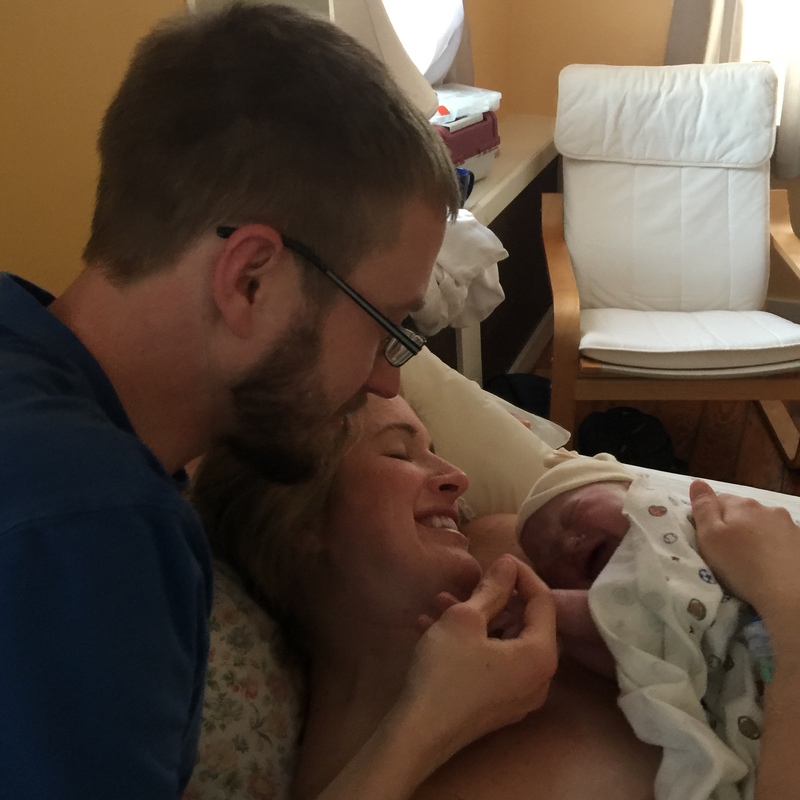 Lo and behold the midwife (Sarah-Grace!) checked me out and confirmed that my water definitely broke, and she decided to do a non-stress test just to check little BabyHam out and make sure he was doing okay. He was doing great. As I sat there in the recliner, my brother walked in the room. Then a few minutes later, my mother and father. I love my family… but they surely don’t listen. We’re all a special kind of stubborn haha. While I was so happy that they were there, I knew it was going to be pretty uneventful for them. 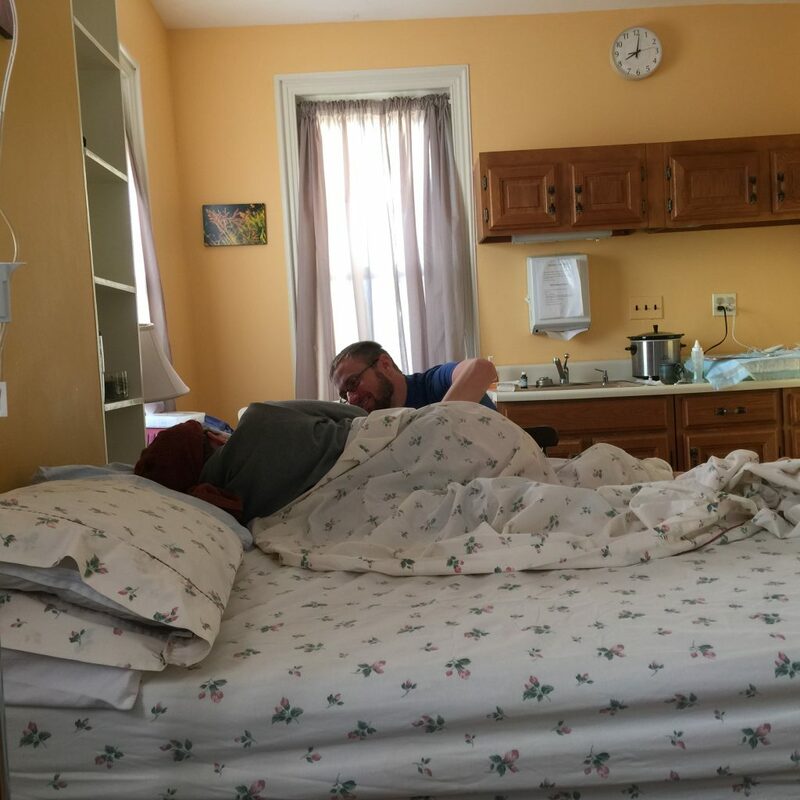 I was having some small contractions here and there, according to the non stress test, but I couldn’t feel them, and my plan had been to do most of my laboring at home. My midwife sat down and had a conversation with me. I was 36 weeks + 6 days. Technically, The Birth Center won’t do high risk pregnancies, and a delivery before 37 weeks could present some complications that they would need to do a transfer to the hospital. Luckily, my awesome midwife was pretty sure that I wouldn’t be delivering that night, most likely the next day, so she said she was good if we were good. (Hang in there little guy!) BabyHam would probably be here at 37 weeks. The stars aligned! However, since I had just gotten my group B strep test that morning, the results weren’t ready yet, so they had to treat me as if I were positive. They started an IV and the plan was to inject me with an antibiotic every 4 hours. But I also wanted to labor at home. So we made the choice to go home… and then I’d have to come back every four hours to get the injection until I went into active labor. I know it was crazy, but I wouldn’t have done it any differently. It sucked knowing that we had to keep coming back every 4 hours because it obviously meant we couldn’t even attempt to get a full night’s sleep. We drove home. I wanted my mom to be with me at the birth, so she decided to take off work that night and come home later with us too. We made dinner that night. I can’t quite remember what we ate. I was still feeling pretty good so we went to take the dogs out for a nice walk around the neighborhood. I had to stop a few times when I felt a contraction coming on, but it was just nice to get out and about. When we came back I decided to rest up on the couch. David packed up the “hospital bag.” And my best pregnancy snuggle buddy joined in. I really felt like Riley knew what was going on, and wanted to be there for me. Dogs really do have a special sense and awareness for these types of things, I feel like. My phone said this picture was taken at 7:33pm that night. And so began my laboring at home. We drove back in probably shortly after this picture was taken to get my next round of antibiotics. And came back home. My mom came to the house at this point, and I really wanted to watch a Friday night movie (it’s tradition in our house!). So David and I went down to the basement and snuggled up on our little theater setup down there at the time (an air mattress on the floor and the projector shooting at the wall). We watched one of my favorite movies… The Little Rascals. 🙂 Just try to picture a super pregnant lady getting on and off an air mattress laying on the floor. What a mess. We ended up putting a folding chair in there so she didn’t have to keep getting off the mattress. I don’t really remember too much of the second half of the movie. That’s when the contractions started to get more intense. Plus, I think I may have been dozing off here and there. I’m pretty sure we didn’t get anywhere close to finishing the movie, too many breaks for contractions, pee breaks, etc. We went back in for another round of antibiotics around midnight or so. The car rides were starting to get more uncomfortable at this point. My midwife said I’d still be a little while. I was welcome to stay at that point, or go home and come back when I felt ready. I decided to go home and try and get some sleep in my own bed. I really don’t know if I got any sleep. This part was such a haze. 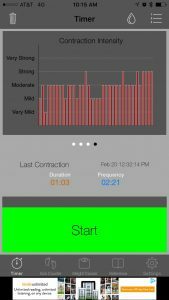 The contractions started to come more often and get more intense. I think it was around 4:30-5am that I ate a piece of toast and we headed in for another round of antibiotics. In the car ride there I decided that I wouldn’t be going back home this time. I felt like it was going to happen soon. Well we got there. I labored. And labored. I decided to take a shower and see if that helped to ease the pain. My mom snapped this picture. The clock stays 8:02am. I think I may have been dozing in and out of sleep here in between contractions. I can’t really remember. I think it was around this time that my midwife’s on-call time was up, and the next one was coming in. So I said goodbye to Sarah-Grace and hello to Dorinda. 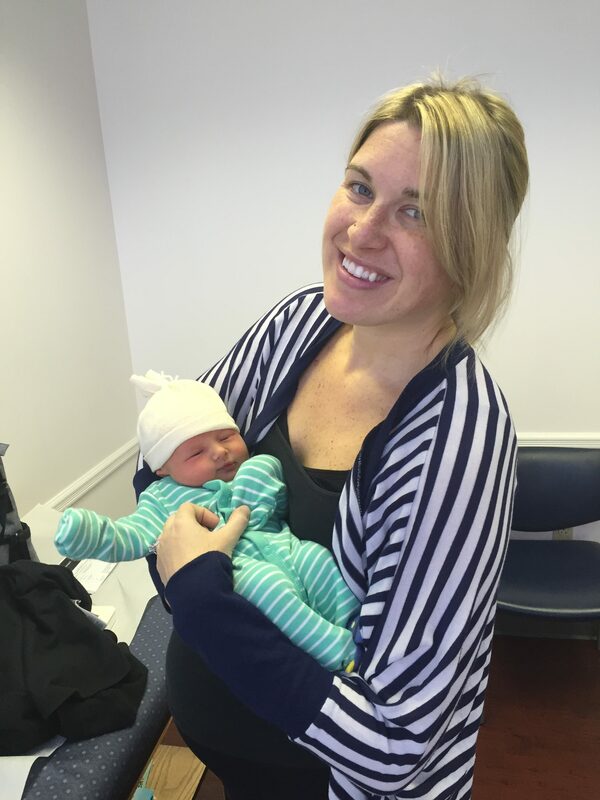 The great thing about The Birth Center is that all of your appointments throughout your pregnancy are with all of the midwives, so you can get to know them each individually, so when you go into labor, and one of them is on call that day, you already know them and feel comfortable with them. I loved them all, and knew that I wouldn’t mind having any of them do my delivery, so this transition never phased me. Dorinda is one of the owners of The Birth Center so I knew I was in good hands. I continued to labor. I used the app Full Term to track my contractions. I highly recommend it, I’m a data nerd so it gave me something to play with. I’m actually looking back at it now for the first time. The data isn’t 100% accurate… looks like I forgot to end some of the timers. I also find it interesting that not one of my contractions were “very strong” in terms of intensity. I guess I just kept thinking in my head that it was just going to get worse. Sometime around noon my contractions just slowed down all together and I stopped tracking them. It was the most frustrating thing on earth. Dorinda told me to go walk the stairs to try and get it going again. I walked those stairs for probably about half an hour, David standing there, helping me when I needed it. Super pregnant me in my robe, with the occasional nurse walking by. Nothing. Nada. I was feeling defeated. If I approached 3pm and wasn’t in active labor, I’d probably have to go to the hospital since we were approaching on the 24 hour mark since my water broke, and I could risk infection. I wanted to try to help do anything I could to get things moving. I didn’t want her to have to go to the hospital; I knew that wasn’t the plan. We were lucky it was a Saturday so she could walk the floor and stairs in relative privacy! Dorinda gave us some options. 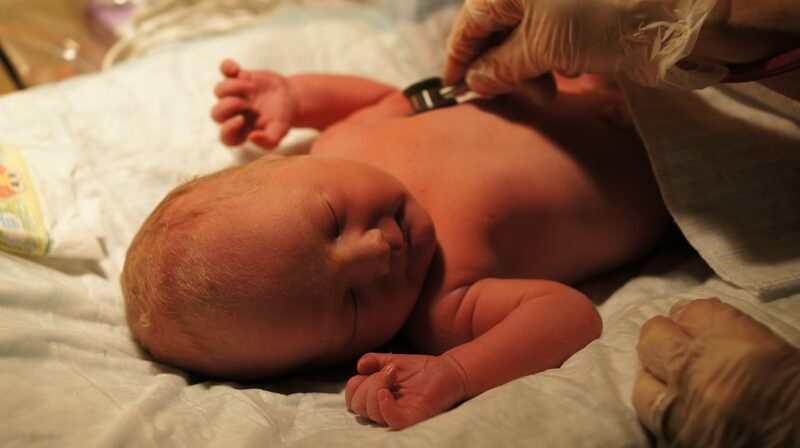 The first was a homeopathic option that was shown to speed up labor. I would stick it under my tongue and let it dissolve. I can’t quite remember what it was, so I’m not going to try and look it up and put the information here without knowing 100%. The second was a “castor oil smoothie.” I know all of you mamas are probably groaning at this. At this point, I was willing to do anything. I wanted to deliver BabyHam and I did not want to go to the hospital. We decided to do them both. The homepathics felt like pop rocks in my mouth. Dorinda made a tasty apricot castor oil smoothie for me. I mean, it was as tasty as a castor oil smoothie could be, I imagine. I downed it. It was probably about 20 minutes later that the contractions started coming strong again. It was INTENSE. I also forgot to mention that BabyHam had been slightly turned in my belly, and he didn’t feel it necessary to move. Most babies are born in the anterior position (this is the most comfortable). 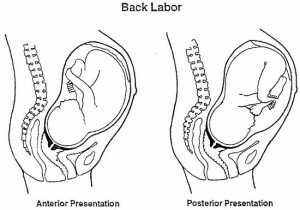 Some babies are born in the posterior position (this is usually uncomfortable, and causes a “back labor”). A posterior position is where your baby has his head down, but the back of his head is against your spine. By the time labour starts, about one baby in 10 is in this back-to-back or posterior position. You may have backache, as your baby's skull is pushing against your spine. Your waters may break in early labour. Your labour may be long and slow, with bouts of contractions starting and stopping. Yep. That sounds like it. All of it. So my back was aching. I really can truly say that I don’t think I could have gotten through ANY of this labor without David. 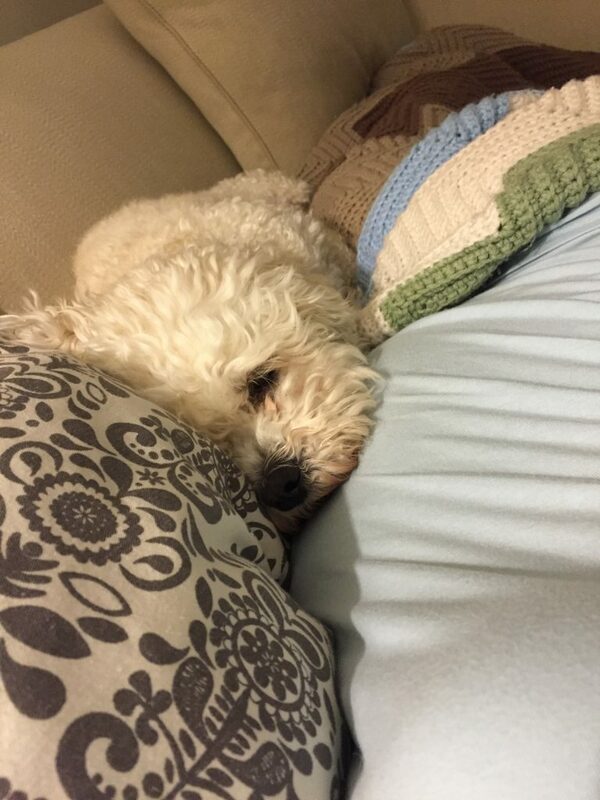 He was a source of constant support, and also a constant source of pressure on my lower back. I NEEDED it and made sure the he never let go during a contraction. Here’s a picture that my Mom snapped. I was sitting on an exercise ball, leaning against the bed, and he was always there, pushing on my back. This picture was clearly taken during a break between contractions. My face is relaxed. When she says I had to push on her back, she means like lock my arms and push all of my weight into her tailbone. If I relaxed a little she’d umm… let me know. Somewhere in the midst of all of this, I threw up that castor oil smoothie. My mom says she can still remember the smell hahahaha. Sorry Mom! In my readings, throwing up was a sign of going into “transition.” I was never so happy to throw up in my life! The contractions started to get worse, and my body just started to push. I felt like I had absolutely no control over it. And now came the worst part. Dorinda said that I wasn’t fully dilated yet, so I wasn’t allowed to push. ARE YOU KIDDING ME??? My body was doing something all on its own. And I was supposed to stop it?? It felt near impossible. Every time it happened it was the worst thing I’ve ever experienced. But not in a pain way. More in a way of, I have no idea how to prevent this from happening, and I’m trying everything I can do, but I just can’t do it. I think I utilized some crazy breathing. I have no idea. I feel like the rest was kind of a blur. I eventually fully dilated, which felt like it took forever. Apparently Dorinda had to manually move part of my cervix out of the way. And then I could push. Of course, when I was allowed to push, my body decided that it really didn’t feel like doing it on it’s own anymore, so it left me up to my own devices. I pushed… for 47 minutes (according to my documents). Yes, the ring of fire is a real thing. No, I really cannot recall the details of this, I just remember thinking it. Then, little BabyHam entered the world! Saturday, February 20th at 4:42pm. I watched him come out. I didn’t know if I would or not, but when the time came, I did, and I definitely don’t regret it. I watched as he had started to crown and after his big ol’ head got through the rest happened so fast. He was so perfect. Dorinda and the other nurse, Katie, picked him up and laid him directly on my chest. I really thought that at this moment I was going to be a complete emotional mess and burst into tears. You know what I did? I just started laughing. I have no idea why. It was just all so amazing and joyful, I guess it was just happiness. He was so adorable, with his little swollen face, I couldn’t get enough. I have so many pictures of those moments, thanks to my amazing mama. And because you lose all modesty when giving birth, I won’t share them. But I’ll just share this one. The moment we became parents. Our little BabyHam. He was so perfect. David and I just spent like an hour or two sitting exactly like this. All snuggled up. David snipped the umbilical cord when the time came. BabyHam latched perfectly and breastfed for awhile. 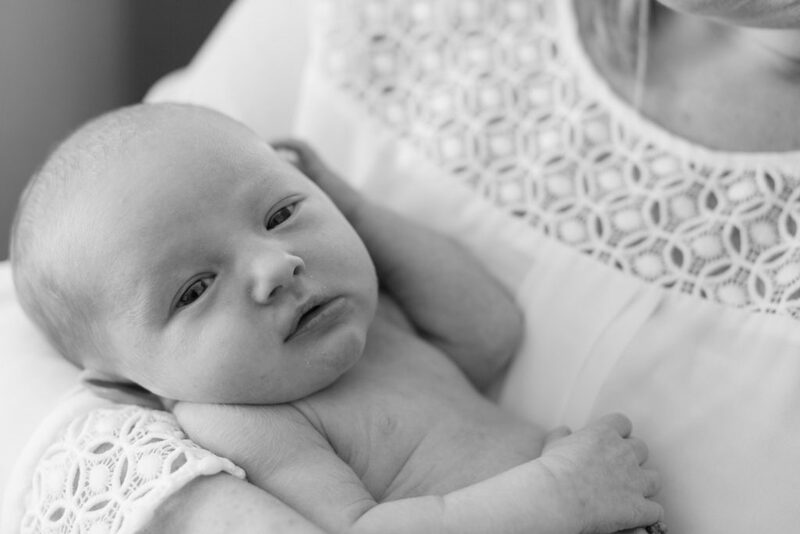 Side note: the next two months of breastfeeding are another story that I’m not quite ready to share, but for now I’ll share this article from the most amazing lactation consultant ever that truly resonates with me. After awhile, he got weighed and got all of his vitals checked. 8lbs 0.5oz. No one believed he was 3 weeks early. Thank god he was, though! He had some low blood sugar so we had to hang around for awhile and encourage him to breastfeed more. It slowly came up to the normal level. I also got to checkout the placenta. Weird, I know, but I was just so curious! It’s pretty amazing what a woman’s body creates. My mom, dad, and brother came to say hello, then left to give us some time. Having my mom there was the best. She not only held my other hand that David wasn’t holding, but she was there to support me, encourage me, and also snap some pictures for us. She’s amazing. David’s Mom, Dad, and sister came to visit too. During that time we changed his very first diaper (holy meconium!). That first change was quite a learning experience. He just seemed so fragile so it was really hard to clean it up while trying not to break him. I took a shower before we headed out, and felt a little lightheaded, but the feeling pretty quickly went away. We brought some food and beer to celebrate, but no one was really feeling it, so we packed it back up. 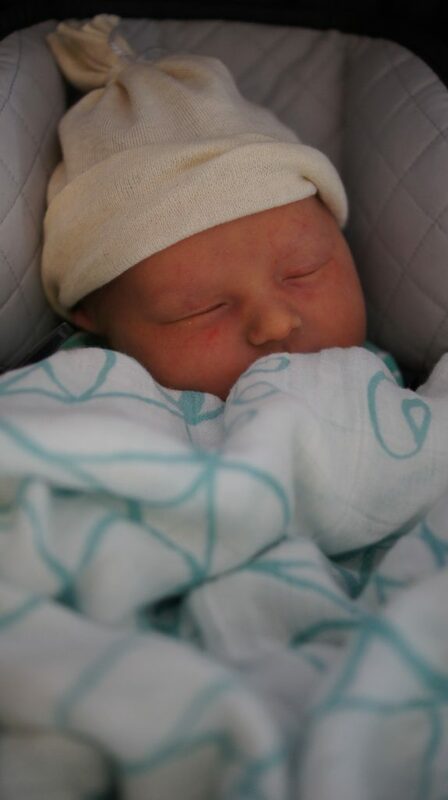 We got BabyHam all packed up, loaded him in his car seat, and the nurse did a final checkout. We headed home about 10pm that night. Part of the great thing about the Birth Center is that you get to go home after a few hours after delivery if everything is going well. I was so happy to go get some sleep in my own bed, with our snuggly little BabyHam at our side. At least that was the plan… We didn’t get much sleep because we were just listening to him breathe and were worried if we couldn’t hear it. You may notice that I’m still referring to him as BabyHam. David and I had a few names in mind for him, but we couldn’t narrow it down. 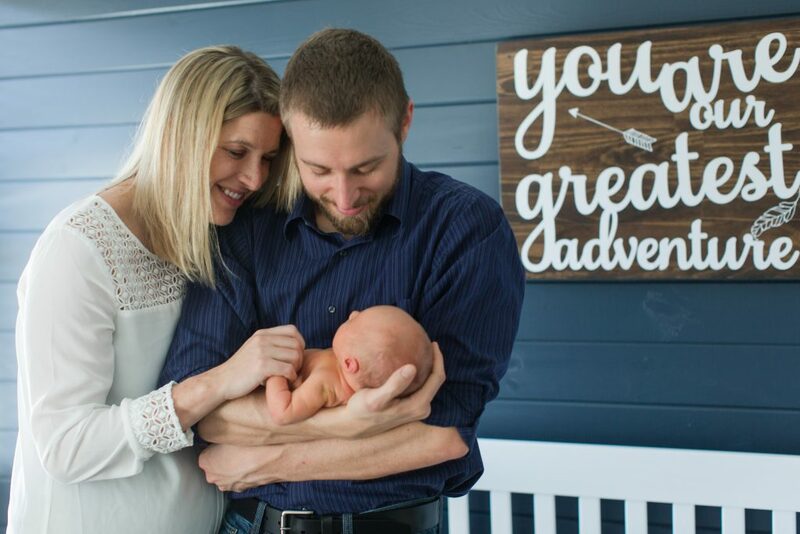 We figured that when he came into the world, we’d meet him and know immediately. Well, we didn’t. We didn’t even really think about his name at all while we were there. We left and went home with all of his papers saying “Baby Hamilton” hahaha. We’re such procrastinators. David and I got home and sat down in the living room for awhile with him. We chatted for a bit, and decided it was going to be Connor. He would also inherit David’s middle name, so it was Connor Matthew Hamilton. We sent out some pictures and texts to friends and family announcing it before we headed to bed. 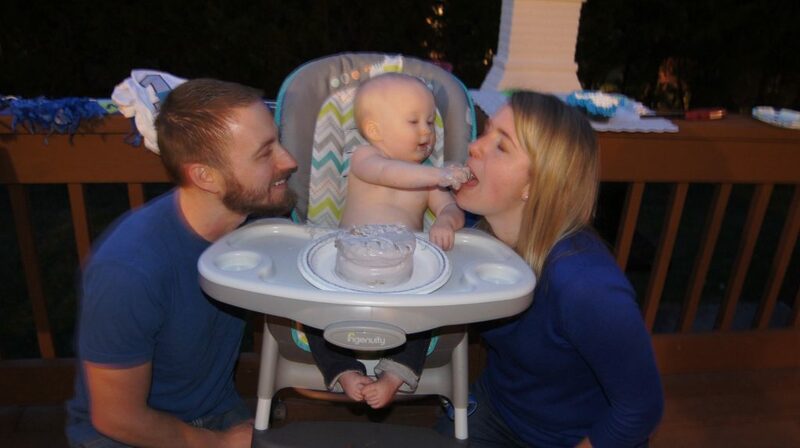 We loved our little Connor. The next few days were such a whirlwind of breastfeeding, naps, snuggling, visitors, David force feeding me, exhaustion, and all around happiness. Notice the salad on my nightstand? I probably wouldn’t have eaten if it weren’t for David, or our CSA. 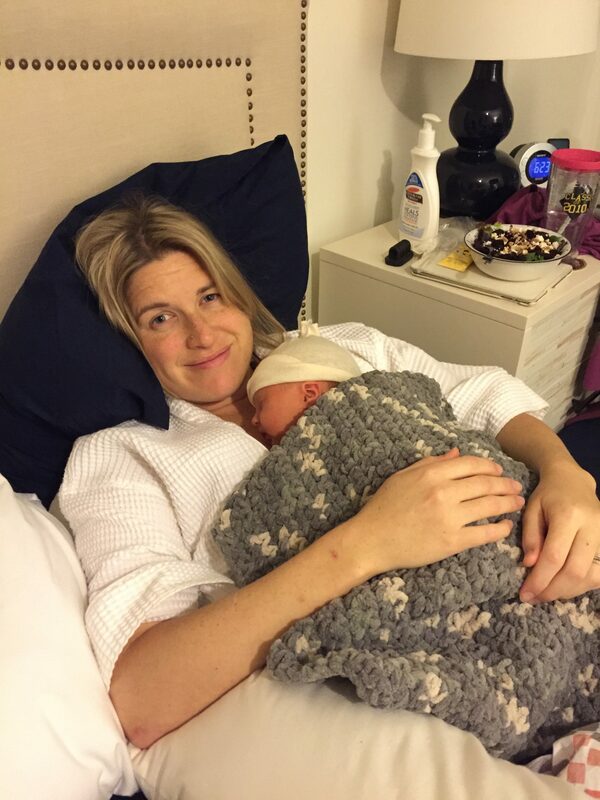 That is the look of a tired, breastfeeding mama is who is so completely and utterly in love! We have such amazing friends and family who all came to meet him and bring us food. One of the nurses from the Birth Center came to do a home visit after a few days. She checked on me, and also Connor. I couldn’t help but to capture this cute moment of her weighing him in our bedroom. Julianne, our nurse, was just so sweet and helpful. That was still scary to watch though, him just hanging over the floor like that. 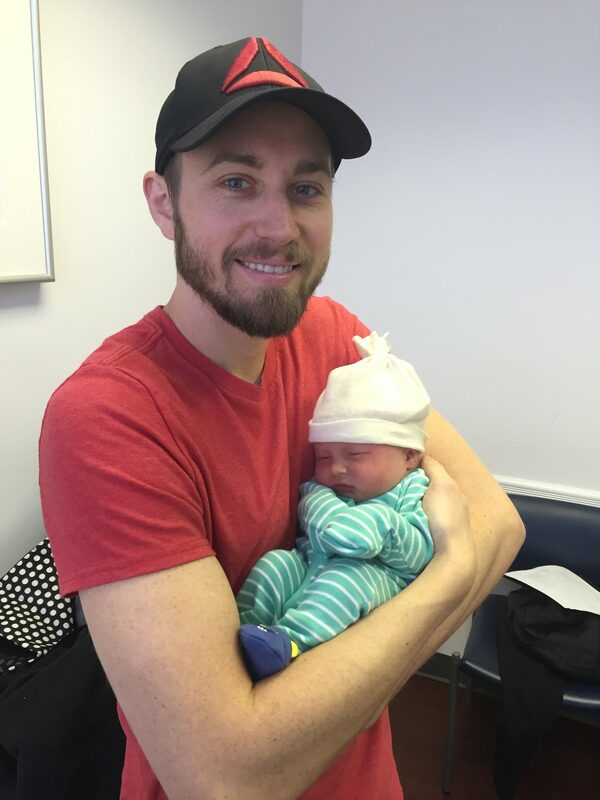 We took Connor to see the pediatrician the next day to get his first checkup. He was doing wonderfully. Happy 1st Birthday, Connor Matthew Hamilton! We love you with all of our hearts, and can’t imagine this life without you! You are the most precious gift we’ve ever received.